With the upcoming release of Rogue Stars I find myself working on miniatures to prep for that game. While North Star Military Figures has the official figures, I decided to work with what I have. Like any game that I collect, I like to have two forces for the game. 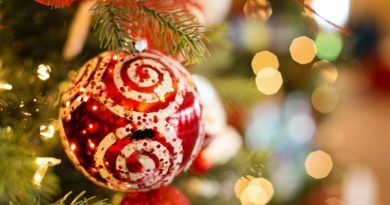 Oddly enough, in my celebration post of six months of Blogging, I posed the question of whether I would ever work with the products from one of the bigger companies. Well, tonight I am. 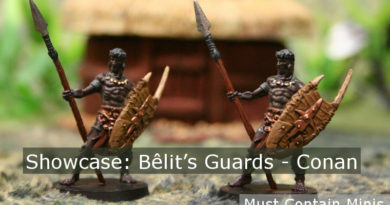 For one side, I will be using GW Chaos Cultists. These models are quite economical as they come in a 5-pack for $12 Canadian. You won’t hear me say this much about the big company, but these figures are a good value for the price. 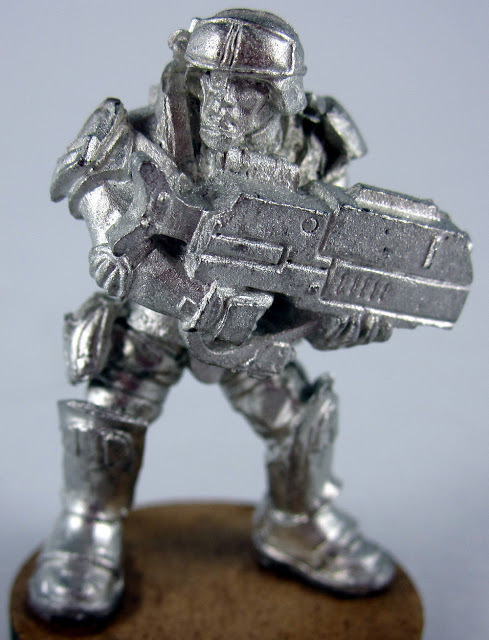 For an opposing force, I will be using a collection of Reaper and RAFM Miniatures. Now some of these figures, my readers will have already seen in my comparison post between GW and Six Squared Studios Bases. Here, all of my GW figures are on the bases that came with them while all of the Reaper and RAFM Miniatures are on bases by Six Squared Studios. 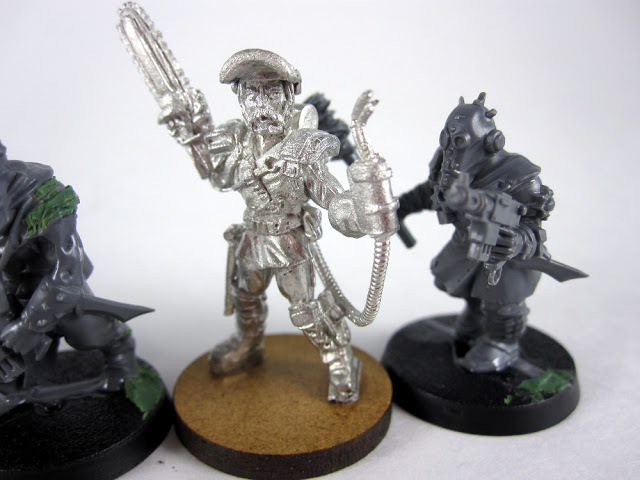 The Reaper and RAFM models will fill a crew as Merchants while the Cultists will represent Space Pirates. Now lets take a look at these models. 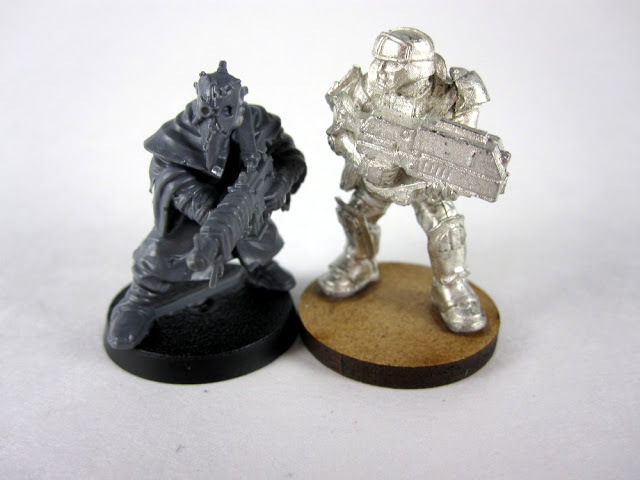 A different Chaos Cultist beside the IMEF Marine. Here the Chaos Cultist model seems didn’t quite match up so I added some green stuff to cover the problem. 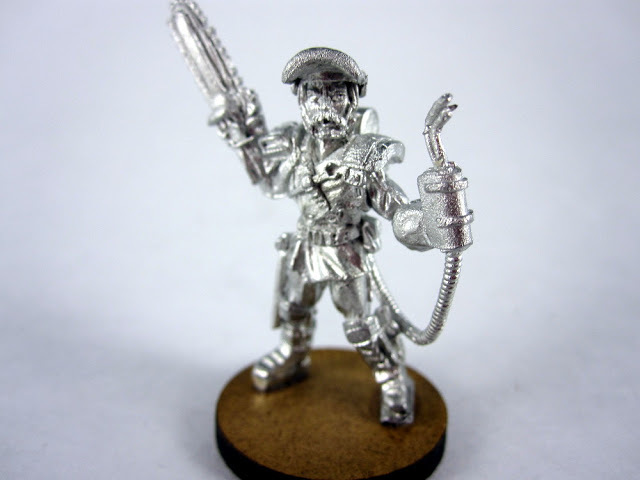 An RAFM McGrover miniature (from the USX Line) beside a Chaos Cultist. 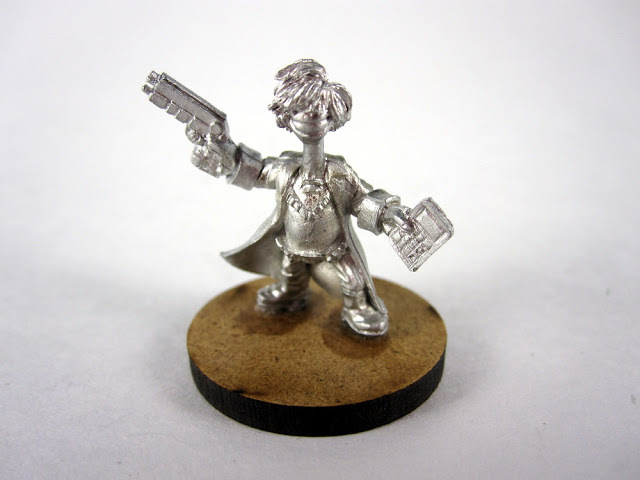 Sparg the Illyrian Agent by Reaper Miniatures. This guy is clearly going to be one of the wheeler and dealers in the Merchant crew. 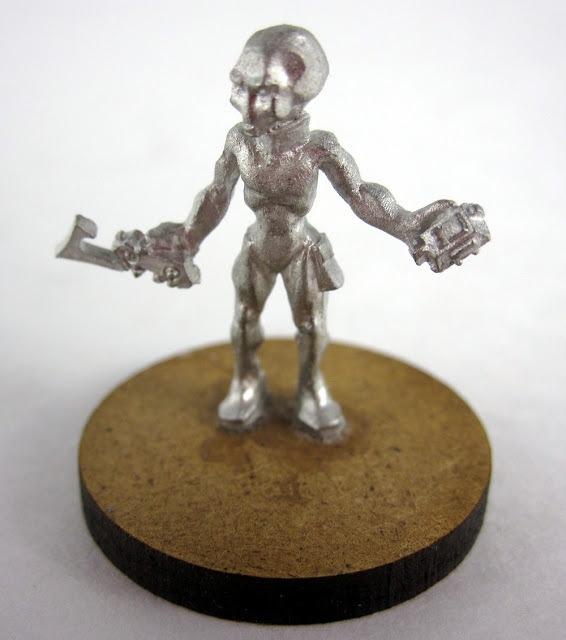 A Merchant Crew gets access to one figure with Military Weapons to help protect them. This will by that guy. 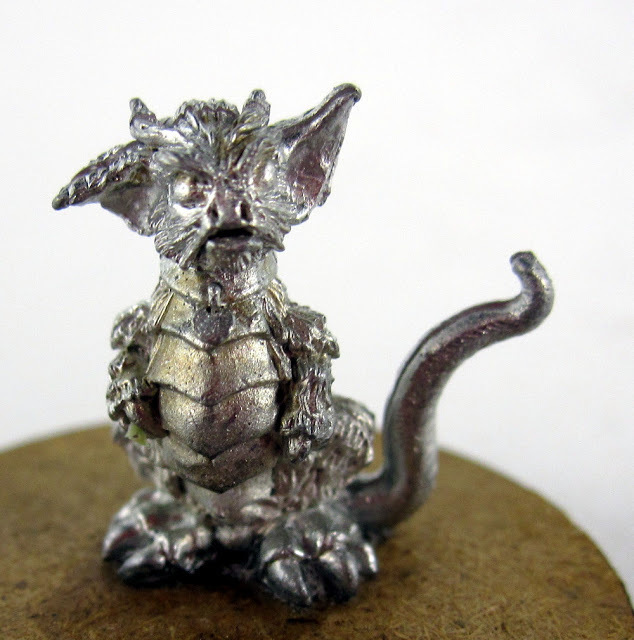 An alien pet by Reaper Miniatures if the points allow. 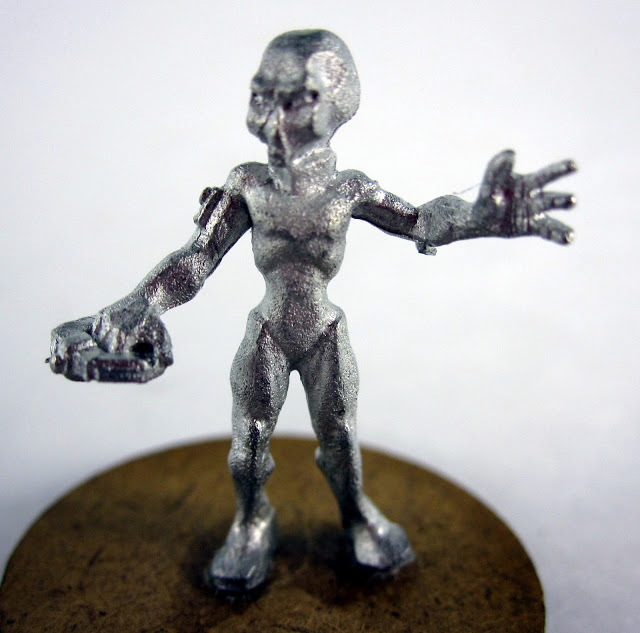 A Gray Alien by Reaper Minaitures that would make a great Psionic if points allow. A second Gray if points allow. This one will likely not have Psionic powers if I take him. 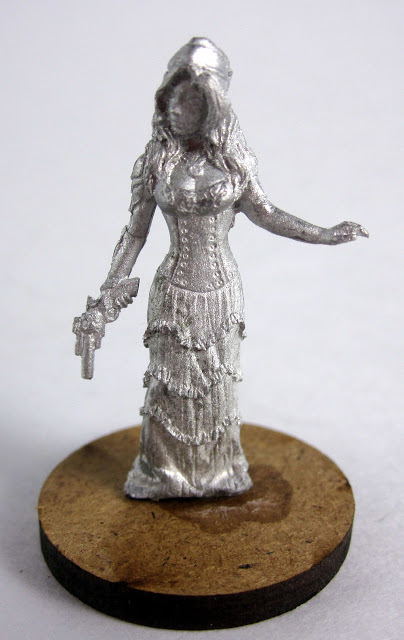 This figure is Kristina Erickson by RAFM Miniatures in their Air Ship Pirates line. She will make an excellent Captain for my crew. 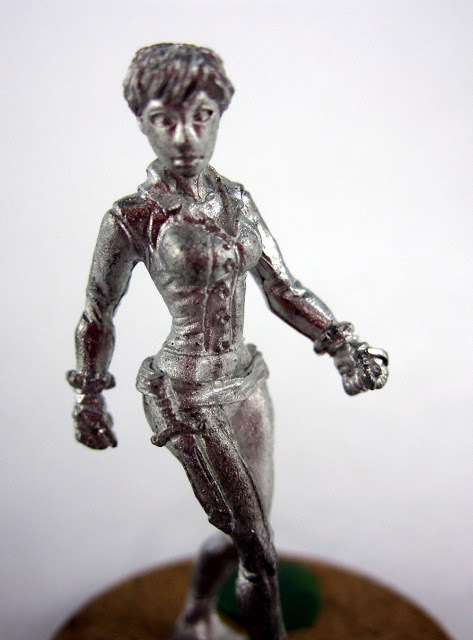 This figure is a Pathfinder Miniature by Reaper Miniatures, but she might find a place as a Rogue in my Space Crew. Also on the paint table are the Highland Infantry that I bought from Crucible Crush. A set of British Highland Infantry with Special Weapons by Pulp Figures. Nice selection of minis. I love seeing a variety of minis in use. Clever selection of the Pathfinder minis. There's a number of good figs in that range that could find a use in sci-fi or steampunk settings. For those looking at buying the GW cultists I highly recommend looking on ebay where you can still usually find sets of the 20 culstists from the Dark Vengence boxed set. 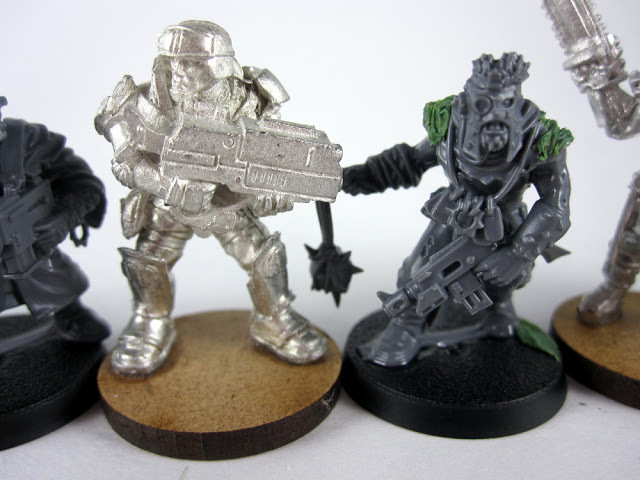 Not only are they a good bit cheaper per-fig, but you get the 3x as many sculpts including leaders, and heavy weapons which aren't availble in the 5-man cultist box.